Product prices and availability are accurate as of 2019-04-22 07:45:20 UTC and are subject to change. Any price and availability information displayed on http://www.amazon.com/ at the time of purchase will apply to the purchase of this product. Honest Outfitters give you the best camping hammock with high-quality camping hammock. Compare to the other hammocks, our portable hammock is extremely SOFT and comfortable. 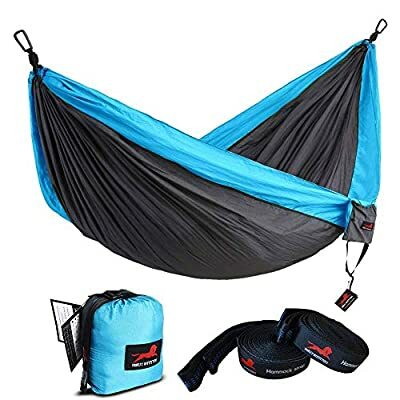 Good Quality The hammock is made of super strong 210T parachute nylon material. This soft, breathable and resistant nylon cloth will last for a long lifetime. We have employed high-grade nylon triple interlocked stitches to maximize hammock strength for your ultimate safety. So the hammock are tested to hold up to 700lbs. Versatile Portable hammocks are super lightweight and compact enough for backpacking, hiking, camping or traveling. These versatile parachute nylon hammocks are also perfect for backyards, parks or beaches. Wherever you decide to hang, the popular Neolite Hammock sets up in seconds and truly is the do-it-all, hang anywhere hammock. Guaranteed If you looking for high quality hammock at an affordable price, please try Honest Outfitters's hammock. We guarantee your 100% satisfaction! If you are not satisfied, please contact us. then we'll replace it for free or refund your money! No questions asked! No hassle! 1. If you have any question, feel free to contact us. We will reply as soon as possiable. 2. Our products' pictures are real and shot by professionals. However, due to differences in computer monitors display, there can be color variations between the actual product and your screen.